Search Results for "candles burning in the dark"
CANDLE ON CANDLE HOLDER,2D handdrawn animation.HD 1080.Includes alpha channel. Happy Birthday cupcake with party gifts on dark wood background. Candles, close-up, fire, oil, message, burn. 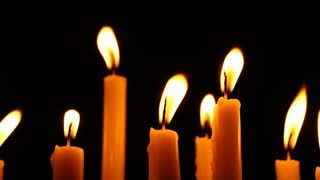 Animated short small intense flames with quickly dissolving smoke as if burning candles or torches. More dense fire and smoke. Top isolated and against transparent background, alpha channel embedded with PNG file. Christmas 0105: Three white candles burn in front of a stone wall (Loop). Animated burning fire and emitting dark smoke as if burning large torch with three flames burning kerosene or other heavy fuel. Transparent background, alpha channel embedded with PNG file. The Burning Sky of Alien Planet. On dark sky flame burns. Over the hazy horizon bright sun. Dark rocks stand in the thick blue mist. The surface reflects a bright red light of the flame. Animated burning large camp fire or large torch with six flames as if burning flammable fuel or material emitting dark and polluted or toxic smoke. Transparent background, alpha channel embedded with PNG file. Animated burning large camp fire or large torch with six intense flames as if burning flammable fuel or material emitting dark and polluted or toxic smoke. Transparent background, alpha channel embedded with PNG file. Animated large torch with three flames burning and emitting very dense and dark smoke as if burning kerosene or other heavy fuel. Transparent background, alpha channel embedded with PNG file. The Burning Nebula over an Alien Planet. The fiery nebula glows in the dark sky. The bright sun in the red halo is moving toward the horizon, slowly floating clouds. Dark rocks and hills stand among a dense green glowing fog. Animation - Burning heart. A heart (drawing of) burns slowly, glows and becomes completely dark brown.